A little while ago I started looking into CPLDs and because you can have things running in parallel, I thought I could use use one to build a logic analyser which saves the sample to external SRAM. At the moment, I still have the Altera MAXII EPM240 development board with an on board 20MHz oscillator. I’ve left out the declarations and initialises out so we can see what’s happening but basically we have 4 states that we cycle through, the write instruction, 16 bit address and the byte to write. We have an 8 bit counter CNT which is reset in each state so that we can count the cycle times of the clock, read the element from the array and write it to the SRAM. It did take a while to get looking right, it’s a rough start but I found that it sometimes didn’t work correctly. This could be because I didn’t follow the SRAM datasheet as it requires a minimum of 1/2 clock cycle when at 3V for things such as CS setup and CS hold time. I added in a clock divider (divide by 8) to slow down the communication as you can see above, we start the clock out once we put CS low (I had it running all the time before) and added in a read function too which turns on an LED if the write matches the read and it seems to work well, Download cpld_sram_read_write. I added in an address variable later on so I could keep a counter of the address we are up to and then we can read up to a certain address and then stop however when you take the simulation and convert it to be synthesised but found that this variable took up at least 30 LEs itself even though it was only 16 bit which pushed the LEs used up to 99 LEs so it won’t fit the 64LE CPLD I was looking to put all this on eventually. 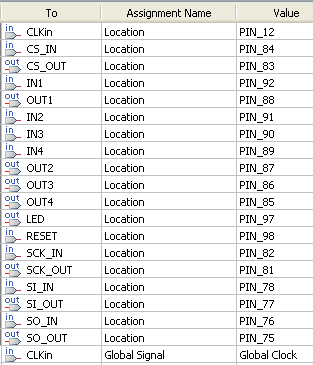 To reduce the LEs used, I think a solution could be to pulse a pin when a write is complete and then the MCU can count/calculate which address the CPLD is up to. 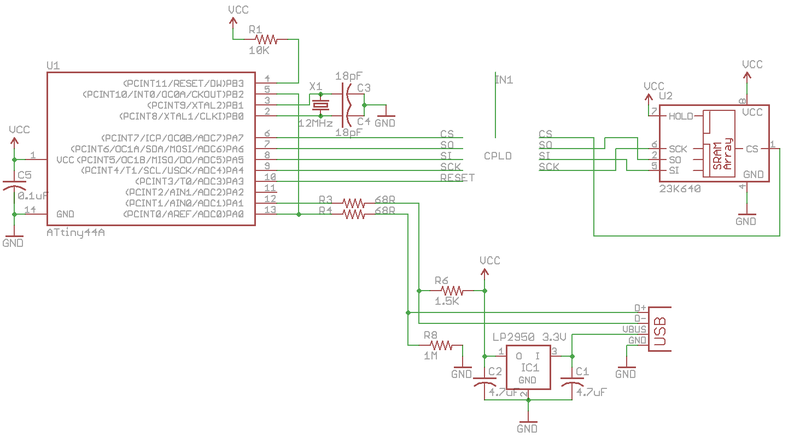 After removing most functionality from the CPLD, we should be able to use an ATtiny with V-USB to communicate with the PC, have the AVR configure the SRAM for sequential writing, begin the write and after writing the address to write to, we hand over to the CPLD to write the data and then stop after a while. We’re now down to 21 LEs even when we have 4 inputs and 4 outputs (the outputs could be separate SRAM chips). Here’s how it looks now, we now have a reset condition which resets all variables instead of using initialise which I’ve heard is something you shouldn’t use (except for simulation). Because the AVR needs to interface with the SRAM as well as the CPLD, when in the reset state, the CPLD basically re-directs the AVR’s SPI output/input to the SRAM. When it’s out of reset, the main clock is divided by 4, we count the clock cycles to 8 and in the clock low periods we sample the 4 inputs (but for the moment, I’m only sampling 1) and this continues until we are put back into reset. Download cpld_sram_write_data_modelsim and cpld_sram_write_data_quartus. Since I have the Scanalogic analyser software I took a look at the format of the file and the old program’s .scl file seems easy enough to modify, the start of each byte of data is 0D 0A and then the number in this case 0. Each digit of the number is placed on it’s own byte such as 193 is split to 1, 9, 3. The 193 as you can see above in the excel shows that the signal went high (11) to low (00000) and then high again (1). I made a little program to convert our decimal number input to the scl format, then pasted the output into the scl file manually and we can now see the waveform above which looks better: dec_to_scl. The only problem is now that the timing information on the Scanalogic software doesn’t match what our sampling rate really was. For the next part I’ll need to increase the speed of the CPLD clock to 100MHz and see if I can find different SRAM options. Maybe you can use open source software http://www.sump.org/projects/analyzer/client for visualization. insideGadgets © 2019 All Rights Reserved. 15 queries in 0.063 seconds.